If you guessed Jello....you are right......a dessert is wiggly if it's made out of gelatin or in this part of the world more commonly known as Jello, no matter what U do it's gonna wiggle. First of all let me clear one thing, it's easy as it's no cooking required dessert other then boiling water BUT it's a time consuming process. If U gonna do all the layers it will take U approximately 2 hours(at least 75% of the time is waiting period, but U need to be around, as this waiting period is divided into several 10-15 minute periods ) but end result is so cute looking, nothing less then an art work. Kids gonna love it but adults also won't say no to it. 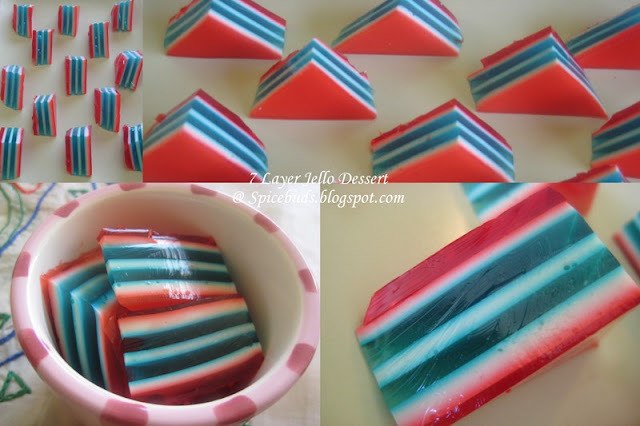 Last week few weeks few months back(I'm lazy but finally I've completed the post :) ) while blog hopping I found this blog and she have this cute collection of jello creations that first look at this picture & I knew it, I'll be making it soon. You really have to look at her pictures as they are so neat& clean, in my case bottom layer stuck a little bit but hers are so impressive. Note : It was still a lot of Jello for our family of 4, but good thing is it can be kept in the fridge and it taste good even after 3-4 days. It's good dessert for a party, U can make it ahead of time and impress your guests with your artwork. Note directly from the original recipe source : Please make sure you have a level refrigerator! Note : 1 pack of Unflavoured gelatin is needed to be divided in 4 parts. 1 pack is around 2&1/4 tsp. so I simply used 1/2 tsp. every time in each jello layer. Mix one half (1.5 ounce) package of Jello with 1/4 package of Knox. (see the note above). Add half cup boiling water and stir to dissolve. Cool to room temperature and pour into dish(8 inch square Pyrex dish). Refrigerate 15 minutes until solid enough for next layer. In a large bowl, mix half can sweetened condensed milk with half cup boiling water. In a small bowl, place 1/4 cup cold water. Sprinkle 1 package of unflavored gelatin on the water. Allow to sit for a 2-3 minutes for gelatin to bloom. Add 1/4 cup boiling water to dissolve the gelatin. Combine the dissolved gelatin with the milk mixture. Now, the milk mixture is ready again we gonna use it in 3 equal parts, total mixture is around one & a half cup. Once cool to room temperature pour half a cup over the Jello mixture(which was set in the fridge). Refrigerate 15 minutes until solid enough for next layer. Refrigerate little longer after final layer to make sure that Jello is fully set and cut into desired shapes. IF you don't want to spend this much time, here's a simple version I usually do from long time back(in fact this pic is also from my initial days of blogging). I always love to do it with fresh fruits but U can certainly do it without any fruits. Couscous - the national dish of North Africa, is a wheat based product made out of semolina of hard wheat using water to bind them. When using couscous for cooking it's a two part process....first part which is most time consuming is forming the couscous (click here to read the process), which is rarely done anymore. You can easily buy instant couscous(ready to cook) in most of the grocery stores, I in fact bought my first pack from my local Indian grocery stores(it came without any instructions to prepare). Second part is cooking it which is a simple process, how simple if you ask me ? So, the answer is as simple as boiling the water, and I mean literally. On the name of cooking U only need to boil water. I've been making this since past one year. I won't say it's a family favourite(given a choice between rice & couscous, my family will choose rice only & 4th grader will specify white rice only please, if not I'll take couscous :) ) but if I make it once or twice a month everybody enjoys it & also it doesn't take long to get it ready, so it's a time saver recipe. Today's recipe is merely a guideline. U can add what ever flavours U like or make it plain & use it with any kind of curry based dish. I have been normally serving it with any kind of fish I make dry or gravy based but last time I served it with pork chops & it was a hit. We love ours with lots of veggies & nuts in it as it give it a little crunch as otherwise the texture is little too soft for our taste buds. Notes : Usually ratio of couscous & water is 1 : 1&1/2 . Using more water can make it mushy/soggy. Take a flat kind of dish. I use square Pyrex dish with lid(avoid using deep pot/pan). Pour the dry couscous on it. Boil the water, once it's boiled take it of the heat add oil,salt, black pepper & lime juice. Pour it on the couscous, cover it & let it rest for 5 minutes. In the meantime finely chop/dice all the veggies. After 5 minutes are over, take the lid off & fluff the couscous with a fork. Add all chopped up veggies and nuts to it & gently mix it., taste & adjust the seasoning if needed. Serve it as is or as a part of a meal. If you add a little more protein to it in addition to nuts, it will be a good lunchbox item and can be prepared a night before. A black Carrot drink, you read it write. It's fermented, made at home....so I call it desi wine. In northern parts of India, during the months of basant(spring) that's march, a seasonal carrot which is dark purple almost similar to beet and is called Kali gajar (Black carrot) comes in to the market, is used to make this drink called Kanji. Perfect for the season when weather is turning warm, as this drink is meant to be consumed during the warm weather, it's good for digestion also. Here in USA, I don't think I'll ever find those carrots. So, many years back when my MIL was here during the march-April months she suggested to use beets along with regular carrots to make Kanji. Color of the food does make a lot of difference, so using a bit of beet solved the color problem. This year in north east we had very mild winter, so with weather permitting I already made this in the beg. of march and it was perfect as it was Holi also at that time. In North India Kanji is kind of a traditional drink around Holi(a festival of colors)........now a days is also a good time. It take 4-5 sunny days to ferment this drink. Once ready it can be kept in the fridge for 2-3 weeks. This drink is good for digestion but is cold in nature, so given it's nature it should be consumed during the warm hours in the day.....means best time is afternoon while enjoying the sun shine. We don't drink it if it's a rainy day specially here in north east, during spring rain makes the temperature fall. It's a fermented drink so don't forget to use glass jar & steel spoons only. Grind the mustard seeds using coffee/spice grinder into little coarse powder(stop when it's few grinds away from being very fine powder). Wash & clean carrots & beet. Cut them into around 2 inch long batons. Put everything in the glass jar & stir it with stainless steel spoon. Close the lid & let it rest on a sunny space for 4-5 days. When it's ready, serve it with carrot & beets from it on the side. If want to store it for longer, strain the drink into another glass jar & refrigerate it. Left over pickled carrots/beets can be either served with Kanji or eaten as salad/side with lunch/dinner. Beets do give you nice color but if U wanna see how pretty the black carrot Kanji is then click here and check Anita's version. And in fact if U google for Kanji, couple of results show U very beautiful picture of Kanji and if you pay even a little attention you will realize that those pictures are same & they are copied from Anita's blog. It's sad that we can't do much about it but at least we can bring these kind of acts in every one's notice, so just doing my part. What was I thinking? When I thought that now my older one is out of Princess & Fairies age, here comes the new favourite The Winx Club....more hi-tech kind of fairies. Yesterday my 4th grader turned 10.....do you notice it's double digit number. Now, for the cake.....last year the picture she drew for me had 6-7 fairies on it, which I totally rejected and we finalised this cake with roses & she loved it. Now, this year she had only planned for one fairy....her fav. one "bloom" matches with the season also we are in right now....spring....but when she showed me the pictures of her I again said "NO". In return she said It's not that difficult "it's just that you have given up on the cake decoration"......do U see she was not even 10(we r talking couple of days before her birthday) at the moment she gave me that push....as my husband says U want to get anything done from her(that's me), challenge her and your work is done....she just did that. After couple of days of bad cold, thanks to home remedies I woke up feeling 95% good on Sunday morning. now, before starting anything else let me explain you few things so that just in case if you plan to do something like this, you are prepared in advance. 1. Lots of goggling help, but in this case there were only couple of sites out of which first one she totally rejected, because the figurines were not up to her marks. Second one she just didn't liked, except the glitter part of her decoration. 2. I did this on Sunday, means everyone home....so make sure you have a husband capable of making breakfast even when his favourite thing to make poha(flatten rice) & bread both are out of stock in your kitchen. OR better if possible send him with the kids to do breakfast in IHOP or somewhere else. Why?? I'll come to that point later, but just an FYI he did made upma. U get the picture when kids are around U CAN NOT DO THIS KIND OF THING, at least in my house....they will have thousand questions, million suggestions.....so for next hour or so I kept calling her to get her approval and her little sis will also come every time, and every time little one will cry that it's my b'day & not Didi's(big sis) and Didi will not forget to remind her that it's not your but MY b'day. he : what were U planning to make them with otherwise???? I used store bought fondant, as my earlier experience with home made fondant is not very good when U have to make figurines, so I decided to go with store bought. Home made or store bought I figured one thing, it's the sugar, if kids like to eat it they gonna finish it before U can even imagine....I had to hide all the decorations from the little one who acts like a sugar monster....she was eying on the little figurine,from the moment I made it....she kept coming & asking me can I eat Didi's cake....for her cake means icing in all forms, actual cake has no importance, it's just a stand to hold all that decorations & icing :)) Hope U guys enjoyed this, as for me it's still not over, this cake was just for us "the Family"......she gonna have a little b'day party after spring break is over but for that I have already planned something...now, only if she doesn't get me into some talking :-).